Developer Jesse Sammis, left, will sell his prime farmland to a conservation group that will sell it to Ayers Brook Goat Dairy, managed by Miles Hooper, right. A developer and conservation groups have reached an agreement that will preserve prime agricultural land at Exit 4 on Interstate 89, ending a controversial plan to build a large development at the Randolph Exit. “This a tremendous victory for everyone who cares deeply about farming in Vermont and for the natural beauty we have here,” said Sandra Levine of Conservation Law Foundation, addressing a group that gathered on a windy hilltop next to the Interstate in Randolph on Tuesday to hear the announcement of the agreement. It was hammered out between CLF, Vermont Natural Resources Council, Preservation Trust of Vermont and developer Jesse Sammis. Sammis had proposed a 1.1 million-square-foot mixed-use development – larger than Taft’s Corner in Williston. Under the agreement, he will instead sell 149 acres to the Montpelier-based Castanea Foundation, a private nonprofit funded by an anonymous Vermont family. It’s dedicated to preserving farmland and, in particular, supporting goat dairies. There is also an option in the agreement for the Preservation Trust of Vermont to purchase another 22 acres, if the money can be raised. Tim Storrow, the Castanea Foundation’s executive director, says the $1.2 million purchase easily fulfills the organization’s mission and has broader implications. Castanea Foundation will purchase 149 acres of land around Exit 4. Preservation Trust has an option to purchase a 22 acres parcel. Storrow says the foundation will sell the conservation easement for the property, then sell the land to Ayers Brook Goat Dairy in Randolph, which will be able to purchase it at a lower price since it will no longer have development value. Miles Hooper of Ayers Brook Goat Dairy told the group that there’s a demand among area farmers for good farmland, and the loss of this property would have hurt local small farms. Hooper says everyone benefits from the agreement. “I think agriculture, whether we are directly involved in it or not, is something that we all appreciate because it’s what keeps our state looking the way it is," Hooper said. "It’s what attracts visitors to our state and fuels our economy. I think it’s what we need to be very careful about moving forward. I think that this moment sets a great precedent for that." Ayers Brook Goat Dairy was established by Vermont Creamery, which was recently sold to Land O’Lakes. However, the dairy was not included in the sale. “By keeping farmland in farming, this also helps to protect Randolph’s historic designated downtown,” says the group's David Hurwitz, who owns a small furniture making business in Randolph. The debate over the controversial project unfolded before the District 3 Environmental Commission, which conducted a partial Act 250 review of the plan. Developer Jesse Sammis says he has a long history of helping to conserve land. Sammis, who is 79, said he decided not to pursue developing the land because the state’s review process takes too long and is too cumbersome. “All my pals who develop in Boston and New York and other parts of the country, they say, 'There’s no way I’d come to Vermont to develop,'” he says. Sammis says he has mixed feelings about the agreement. Conservation groups say under the agreement they’ll pay considerably less than the appraised value of the land. Brian Shupe, executive director of VNRC, said the agreement illustrates that the development review process works. “It’s a significant win for conservation and I think it’s a significant win for Act 250," says Shupe. "It played a role in bringing the developer to the table to look at alternatives to a bad project." There is one critical piece of property whose fate is still uncertain. 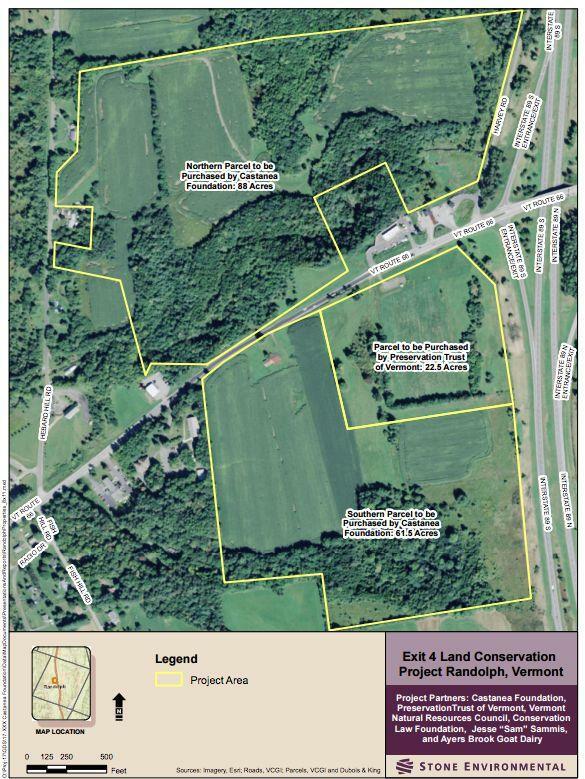 In addition to the 149 acres of farmland purchased by the Castanea Foundation, there is a 22-acre site that Preservation Trust of Vermont has the opportunity to buy if it can raise $1 million by June 15. The property provides a panoramic view of the mountains from the interstate. Bruhn says $150,000 has been raised so far, but the amount of money involved in the purchase and the short timeline is formidable. Sammis says if Preservation Trust fails to raise enough to buy the land, he’ll pursue building a hotel on it, a plan that would likely be opposed by Exit 4 Open Space. David Horwitz says the group isn’t against a hotel, but would like to see one in a location that would benefit downtown. 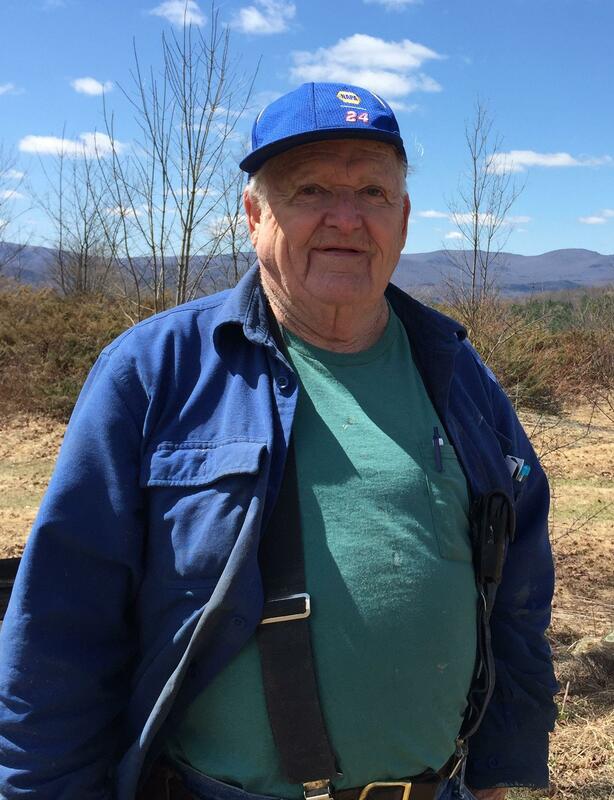 Paul MacAdams, who once farmed the land, is happy it's being conserved. Paul MacAdams of Braintree, who also attended the announcement, has a connection to the land. Back in the 1960s and '70s, MacAdams had a dairy farm on the some of the property that’s being preserved. He summed up his feelings in a word. Sammis had envisioned a development that included light industry and office space, housing and a visitor center with retail space and a hotel. His initial proposal would have developed more than 70 acres that the state has identified as prime agricultural land. In exchange, Sammis wanted to pay a fee to preserve land elsewhere. But the Vermont Natural Resources Council and Conservation Law Foundation told the commission that the proposal did not meet the criteria for off-site mitigation, and if the commission approved the plan it would set a precedent that could affect development on farmland throughout the state. Concerns were also raised about the environmental impact of the project and its effect on the downtown business district. The plan had already been approved by the Randolph Development Review Board and supported by the select board. Fourteen months ago, after a number of hearings, Sammis withdrew his proposal before the commission had finished its work. At the time, negotiations were underway between Sammis, CLF, VNRC and Preservation Trust of Vermont, which led to the agreement to sell and preserve the land. The District 3 Environmental Commission held a final hearing this week as it considers a large-scale development proposal for Exit 4 in Randolph. During a visit to the site Monday, commission members tried to imagine where the lines on a map of the development might cross the field of winter rye. A proposal for a major development at the Randolph exit of Interstate 89 has been withdrawn. Developer Jesse Sammis is asking the District 3 Environmental Commission to end its partial review of the plan which called for a mixed use development on 172 acres at Exit 4. Developers are being sent back to the drawing board in their plans for Exit 4 on I-89 in Randolph. Environmental groups and developer Jesse Sammis have told the District 3 Environmental Commission they intend to use mediation to try to resolve their differences over a large multi-use project proposed for 172 acres at the Randolph exit on I-89. In November, after several sessions during which the commission heard sometimes contentious testimony, parties asked for time to try negotiate an agreement. A large mixed-use development proposed for Exit 4 on Interstate 89 has attracted statewide attention as a district environmental commission weighs the impact on farmland. The developer planning a large mixed-use project at the Randolph exit of I-89 will meet with the environmental groups opposing the plan to try to reach a compromise.